Did the Irish Discover North America? Surprising New Theories! The accepted theory that Scandinavian explorers were the first to discover the Americas, long before Columbus, has been taking a battering lately. There’s now more evidence to support the discovery* of North America by the Irish. 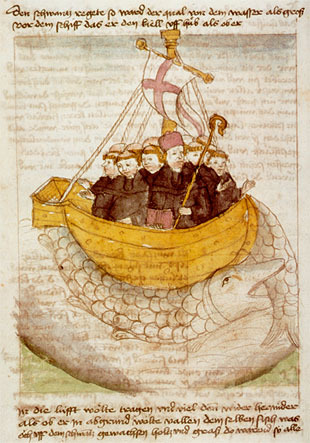 Medieval manuscript illustration of St. Brendan’s voyage to the New World. When Spanish explorers first came to the Americas in the early 1500s, some explored the Carolinas and founded a settlement in Georgia around 1526. The settlement was near Charleston, South Carolina, and was populated by fairer-skinned, very tall people with beards — completely unlike the local Native American tribes. Relations between these agrarian settlers and the native population are recorded as being peaceful, and one fairly detailed account of their way of life was recorded by Spanish chroniclers at the time. Archaeologists for decades dismissed this account because it was so divergent from all other accounts of Native American villages and physical types. However, in 2006 a team of Native American scholars began a project to review all evidence of pre-European Native American life, and were stumped by the description of the Duhare community. After extensive study of the language fragments recorded by the Spanish, they could not find a correlation with any known Native American language group. However, what they did find, is a close correlation with medieval Irish. The translations suggest that the village of Duhare (in Irish, du’hEir — place of the Irish) may have been populated by a group from Ireland. The tattoos and decoration with pigments of high-status people (Datha, meaning “painted,” was a common word in medieval Irish), the evident physical perfection of their leadership, the agricultural practices, and the language fragments all support the suggestion that a group of medieval Irish had reached the new world and found a hospitable environment along the SC coast. It’s no wonder I felt so at home in the Carolinas when I arrived here. We’ve long known that the people of Appalachia are profoundly Scots-Irish, but now it seems that the region may have even deeper Irish roots. *Forgive me for the link bait. Google seems to like declarative headlines, so I’m experimenting with headlines and intros that might bring more traffic, rather than accurately summarize an article. Nobody really discovers a country that has its own population. The Americas were there all along and didn’t pop into being for Columbus or anybody else. In a future post I’ll have to explore some of the other theories and evidence for links between Ireland and the Americas. What do you think of the Spanish story that South American Incas thought the Spaniards were returned ancient visitors who were white and bearded? They had expected a return of these ancient foreigners and thought the Spanish were them, and initially made them welcome. Really? I wasn’t aware of that. I think there’s little doubt that Europeans voyaged to the Americas long before Columbus; we just don’t have absolute evidence to prove the who, where, and when.